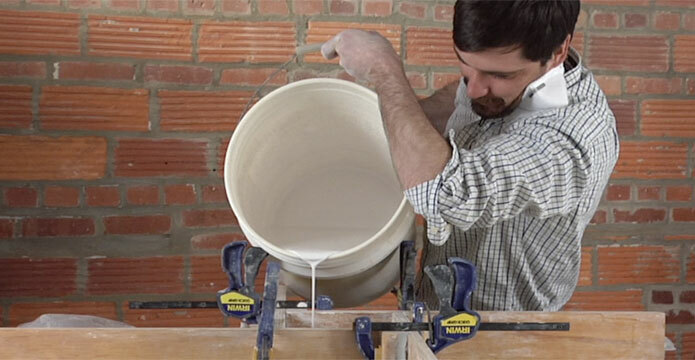 Make Custom Slump Molds for Pottery on a Potter's Wheel! Ceramic slump molds are great tools in the studio. You can buy perfect molds from manufacturers in all shapes and sizes, or you can make custom ceramic slump molds to create more personal forms. If you want to make custom slump molds at home, you can use many different materials–from pottery plaster to plywood to insulation foam. But my favorite material to use for ceramic slump molds is bisque-fired clay itself. In today’s video clip, an excerpt from her full-length video Molds & Mishima: Handbuilding & Decorating, Charlotte, North Carolina, artist Julie Wiggins shows how she makes simple ceramic slump molds by throwing a ring of clay on the wheel and altering it into any shape she wants. –Jennifer Poellot Harnetty, editor. Slump mold definition: A typically shallow frame or mold into which a slab of clay is allowed to fall or settle in order to form a vessel. These can be frames with no bottom, as in today’s video clip. Hump mold definition: A convex form over which clay slabs are draped until stiff enough to hold the shape. So, which mold should you use? There are advantages to both ceramic slump molds and hump molds. Hump molds are great because you can add a foot to the bottom right away, which reduces the potential for cracking at the joint. But if you leave a slab draped over a hump mold too long, it could shrink and crack. You don’t have this worry with ceramic slump molds. But as with most things, it comes down to personal preference and the project itself. Experiment with both slump molds and hump molds for clay and see what you think! Here are three great hump mold techniques to get started! Tell us in the comments which kind of molds you use in your studio! Add:, artist, bisque, bisque fired clay, ceramic, ceramic slump molds, clay, create, decorating, foam, foot, form, forms, handbuilding, hump mold, hump molds, hump molds for clay, in the studio, make, material, materials, mishima, mold, molds, plaster, pottery, pottery plaster, project, shape, slab, slump mold, slump mold definition, slump molds, studio, techniques, throwing, tools, use, vessel.